Traditional public transit faces a giant challenge from robocars. Side-by-side, transit is unable to compete with solo electric robocars in almost every way, including (to the surprise of most of us) overall system energy efficiency. Off peak, when roads are not so heavily congested, there is no competition, but at times of heavy travel, road capacity may not (at least in the first decade) be sufficient. Rush hour is where shared transportation can shine. Today, transit's rush hour advantage can come from two sources. By putting many people in the same vehicle, it can take up less road capacity per person and also be energy efficient. Secondly, it is often given private right-of-way to bypass the heavy public traffic, which can give it both fast travel times and reliable times -- both of these have high value. While those are great, transit typically has to make frequent stops for passengers, increasing trip time and also requiring more resources for stops & stations. Transit also runs on lines with schedules, and it is often necessary for passengers to change lines to get where they're going, meaning extra distance and waits -- so much so that people try hard to avoid transfers, and are really ruluctant to need 2 or more of them. It should be noted that the above thesis often generates a powerful contrary response. We've been told that our big transit vehicles are the green and socially conscious choice for so long that some people keep insisting on it even after seeing the math. It's counter intuitive to imagine that the optimum size for efficiency is smaller than we use today, because when totally full, bigger is indeed normally better. But those sizes were chosen in an era when you needed drivers, and drivers cost a lot, so fewer, larger vehicles are the only way to be cost effective. This article explores what happens when the reign of the driver ends. To understand the fate of mass transit, it is worth examining what it might compete with in the future, a different vision of group transportation that is not scheduled, but combines the best of both worlds. The world already has a small taste of this from services like UberPool, and will get more in the days to come. The shortest description for this future might be the "frictionless vanpool" or "Vansit" -- a system based on medium sized vehicles combined with synchronized solo last mile vehicles for a trip that's more efficient than transit but with almost all the advantages of private transportation. Imagine Ava, a rush-hour commuter of 2025. At some point she signals it's time to start her commute. She might do it at the same time every day, or may even schedule it the night before. She may also wish to leave only when "she is ready" and indicates that on her phone, though she almost always has a time window. More commonly she specifies when she needs to get to her destination and lets the system figure when she has to leave. The system finds a group of people with a large common section in their trips. The computer of her chosen transportation service company (public or private) is receiving these requests. During rush hour, it almost always notices clusters of people who are all traveling at the same time, and who share much (but usually not all) of the same route. Not people all going from precisely A to precisely B, but rather a group of people whose route would go through A and through B with minimal detour. A look at highways and transit lines shows there are scores of people every second with a major part of their trip in common. When a decent number -- say 10 to 16 -- of these people are identified, the system dispatches (at precisely calculated times) small one-person robocars to their homes. (Some of them may own such cars and not need this dispatch. Some may use scooters or bikes. Some may get a ride. Some may walk.) Ava sees a countdown of when she should leave. Some days she aborts it and requests a trip for later when she changes her mind. But mostly she steps out just a minute before departure time, and gets into the car waiting for her. Her small car and 15 others move towards a good common point, such as a small lot near a major artery or highway. The trip for all of them is just a kilometer or two and takes under 5 minutes. The system is monitoring traffic, and has picked up everybody at the right time so they will all arrive within seconds of one another. As Ava and the others pull into the lot, another vehicle has also recently arrived. This is a van or minibus which seats around 10 to 16, and each of them has an assigned seat aboard it. The van does not need a central aisle or main door; rather it has parked perfectly next to a small raised ramp, and opened up doors on its sides. The passengers walk up the ramp and enter their row. With a door for each row it's very quick. These are middle income passengers, the sort of people who used to commute by private car. 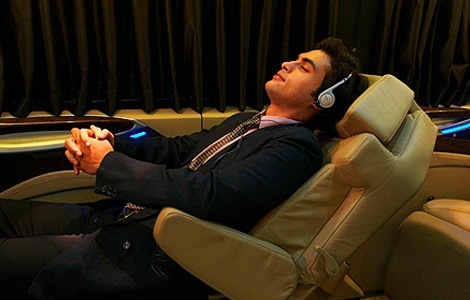 At their price point, the seats are not bus seats, but closer to nice airline style business class seats -- comfortable, wide seats with privacy, power, a screen, a tray-table and other amenities like perhaps even a tiny fridge and a privacy screen. The imagined van is 7'8" wide to be 4 seats wide, and has 4 rows. Trips are short and nonstop, so there's no bathroom. It drives so precisely that this wide berth is not an issue. It has no driver, so with 4 rows it is only a tad longer than a modern sedan. The suspension is soft, smooth and under dynamic computer control based on scans of the road surface -- there being no reason to give the driver a feel for the road -- and bumps are barely felt. Each passenger nests in, and the side doors close. They barely notice the gentle acceleration as the vehicle starts off, then heads to the highway and downtown. Meanwhile, the one-person vehicles which brought them to the lot trundle off to other assignments for other commuters in the area. Some commuters, who did not match up with enough people, may be slotted into smaller vehicles similar to today's 4-seat cars, or some get highway-capable solo pods able to take them all the way. On the busiest routes, many might rarely see a larger vehicle like a bus with 40 or even double-decker or articulating vehicles with 60 seats. As the van approaches the downtown, it heads for the rough region where all its passengers work. In some cases, many work in the same building, and if so, it just heads there, but otherwise it goes to another lot just like the one it left. As it docks there, the doors open and the passengers see a line of smaller cars for 1-4 people that have also just arrived. Each one is displaying the names of the people who will ride it -- and their phones are also giving them this information. Regular sedans are there when 3 or 4 people are going to the same building or block. Ava's the only one going to her building so a short-range single person car awaits here and zips her there. When done, it goes off to pick up another passenger from another van, or possibly picks up a passenger doing a reverse commute. It will do this many times during the rush hour, as its trips are just 1-2 km -- usually under one km in the CBD. Ava's van went on the highway, so it might use some special carpool/vanpool lanes just for robovans. These lanes were built down the center of the old highway, and are divided with thin barriers from the other lanes which carry mixed (human and robocar) traffic. The 3 central lanes are dynamic. All 3 go downtown in the morning, and all 3 leave town in the afternoon. Mid-day there is one lane each way and a buffer lane (to avoid the winds when big vehicles pass.) The robocars are quite able to handle the dynamic change of lane direction and even safely passing in opposite directions at high speed with no physical barrier. Indeed, if Ava's commute were a short one of 5 miles or so, she probably would have just stayed in a one-person vehicle for the whole trip and done it door to door. And some people choose to do that even for the 30 minute commute, though they pay more road toll and car fee per person. These one person commute pods are the most common vehicles on city streets, and combined with shorter headways, 4 of them fit in the same space that was used for a car in the old days -- and once safe, they even draft other cars to save energy. When the van got to its destination, it would then serve the smaller number of people doing the "reverse commute." Depending on the need for rides at the new destination, the company might send fewer full vans, or lose a bit of efficiency by not filling the vans entirely or sending smaller vehicles in the fleet. Transit lines all send their vehicle back in the low-demand direction as well, but they don't dynamically adjust what they send to the demand. Unlike many types of transit, such as rail, there is no strong need for a monopoly in transit operated this way. There is instead an advantage to having a single road and tunnel system which all providers can use, perhaps for an appropriate fee. Competition generally results in vastly superior service and prices for customers. At the same time, on routes with low usage, there is less room for competition. In these situations, it makes sense for competitors to pool their resources, and customers will want that. Just as airlines often do with their code-shares, your chosen provider will probably often decide to serve you by re-selling a seat provided by a competitor if they don't have enough business to give you quick service. You would rather ride soon than with them after all, and worse, you might just decide to give your business to a competitor if they have a quicker or cheaper ride for you, even if it doesn't have the same quality. Robotic transit offers the ability to gain the efficiency of public mass transit while retaining the huge customer advantages that come from competition, and without subsidies. If subsidization is needed, cities and employers can subsidize riders rather than companies, giving them vouchers good with any provider. The 16 person van is just one example. There will be service on classic larger buses and trains as well, possibly even still driven by people, at lower prices or with longer waits. There will also be service in variations of old-school 4 person cars and any other size that makes sense in the market. 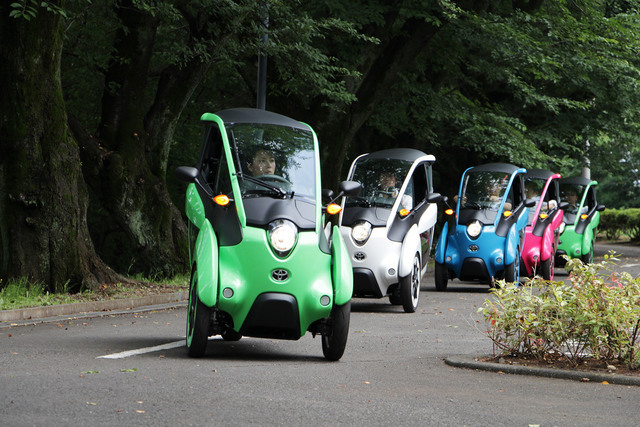 The fleet will consist of many sizes, and try to use the right size to match the passenger demand. Only rarely will you need to send out a big vehicle and only partly fill it, the way today's transit does. And that is why the mixed fleet wins on sustainability. It may be possible -- at much higher cost -- to do some or all of this with human drivers. First of all, one might use robotaxis for only the "last/first mile" trips to and from the vans, and use vans driven by humans. Short-range small robotaxis are an easier problem, and will be arriving sooner. In fact, in Scottsdale, Arizona, Waymo has already deployed them, and other companies promise to deploy them later in 2018. The last/first mile trips could also be human driven. Because the trips are all in the commute direction, each driver would need to drive vacant half the time, which would need to be compensated for. Today, taxis and Uber include a "flag drop" fee and a minimum fee which make short, sub-mile trips quite expensive and interfere with this approach. On the other hand, if drivers were hired for an hourly and per-mile fee, regardless of the number of trips, it could become economical. $30/hour for car and driver with 6 trips per hour would mean a cost of $5/trip, which is a bit high. Last/first mile trips could also be accomplished by bicycle (but less so in bad weather) or scooter. And some fraction of people (especially at the workplace end) would be within walking distance. Outside of rush hour, there is available capacity on the roads. Most trips will now switch to private vehicles, except perhaps during the lunchtime peak. The vans are big, so it would be wasteful to use them for solo passengers, though they might make on-demand runs for groups of 4 or more. They might also make sense for long haul trips, particularly if they can slot in an aisle and a toilet. It makes sense for people to travel together for efficiency and comfort on these long hauls. Trips to cottage country could make sense in them, as well. They might also find use as corporate shuttles until rush hour starts again. The non-peak trip will be private and door-to-door. This is quite efficient if the vehicle is small and light. While there will be some efforts to ride-share, the cost of the private vehicles will be so low that to gain traction, the ride-share will need to be very efficient with minimal waiting. As above, ride share need not mean being delayed while your vehicle takes a detour to pick up the next passenger. Instead, it can be a combination of short hops in small one-person vehicles to the best point to meet. While it is possible to design the vans to handle wheelchair passengers, a better plan might be so simply give most wheelchair passengers direct door to door ries in vehicles designed specifically for this, solo vehicles that let people roll right in. If desired, a more limited number of fully accessible vans could exist. Passengers wanting one would take a longer trip to the common point in their solo vehicle because of lower demand, but their trips would continue to have all the advantages of the trips described above. While many are surprised to learn that mass transit is not very energy efficient when systems are compared to systems, there is a reason behind the instincts people have that it's a better choice either for riders or cities. Today, a surprising percentage of the cost of running a transit system is the drivers, and just as cars will be able to run without drivers, so can transit vehicles. In some cities, there are trains that already do and have done so for a while. At rush hour, large transit vehicles like trains and articulated buses packed with people are highly efficient, but that efficiency is erased when they also run off-peak with light loads. If a system is able to afford large vehicles only for rush-hour it can be energy and space efficent, but will not likely be cost-efficient. Transit systems can increase efficiency by forcing people to conform to their schedules and bunch up their travel, and by having them walk to transit hubs, but at a cost in rider satisfaction -- which drives people into private cars. For legacy reasons, in most cities existing private right-of-ways belong to transit lines, and it will be some time before access to such ROWs is made available to robotic vehicles. During that period, the transit lines will offer more reliable congestion-free travel times on those specific routes. One special advantage of existing vehicles is that the driver is also a supervisor. That's obviously important on a school bus -- to have some adult present. While you would not use these vans at night with low occupancy, if there are security risks during rush hour some sort of control will be needed, such as remote oversight (over the network) or in extreme cases, a worker on board who does not drive but provides other services. Mass transit won't vanish overnight, of course. There's huge investment and huge inertia behind it. There are unions. There are a surprising number of people who believe it is inherently "right" even after looking at the actual total cost and energy numbers. It even has those who advocate it for its own sake -- rather than a means towards goals like energy and road efficiency -- who view it as part of city life and social life. Robocars will start acting as public transporation first as taxis, like Uber. Already, services like Uber are offering pooled ride-share services (UberPool) with human drivers at the wheel. The taxi services will offer the same thing. Those who switch their commute to this mode will be interested in the money-saving aspects of pooling, and the fact that our current fleet is almost entirely 4 or 5 passenger vehicles means huge quantities of empty seats are moving that can be sold by an enterprising company. Uberpool is already fairly succesful according to reports, and expanding. Soon I would expect to see Uber style cars designed for sharing, which might have dividers to give each occupant more privacy and other useful features, like tray tables and chilled drinks. Full road metering -- described in this article on congestion -- would further encourage pooling. Either fees, or a higher priority at getting road use slots given to vehicles with more people (not seats) on them would create a strong incentive. If you're told "there is no road slot available for you at 8:30am in a solo vehicle but there are plenty of slots in an 8 person vehicle" people would switch in a heartbeat. The transition is intended to be slow. As road capacity increases, congestion drops, and scheduled mass transit lines will see serious rider fall-off except where they have exclusive private ROW and reliable service. Even those will see fall-off except when highly subsidized for the poorest people. Older transit vehicles can get reurposed for high-volume unscheduled transit. Even unscheduled trains are possible, though rail faces the problem that it is very difficult for trains to pass other trains. In the most distant future, dedicated ROWs will get repurposed as described below, or we may see new train technologies that do allow passing and "offline" stations where the rail cars (now just cars, not trains of cars) can stop without blocking the main line. This may remind you of the transit-of-the-future-of-the-past, PRT or its cousin GRT. This model does expect everybody to have access to the internet, ideally in a mobile device. I think in 2025 we'll be there in many places. If you don't have a mobile device, but can get access to the internet (through anybody's device or kiosks) you can still book a ride on a schedule, you just can't summon on-demand from where you are. You could of course have the buses and vans today, driven by people, at the cost of 1-2 seats. You still need a way to get people to and from the transfer points. 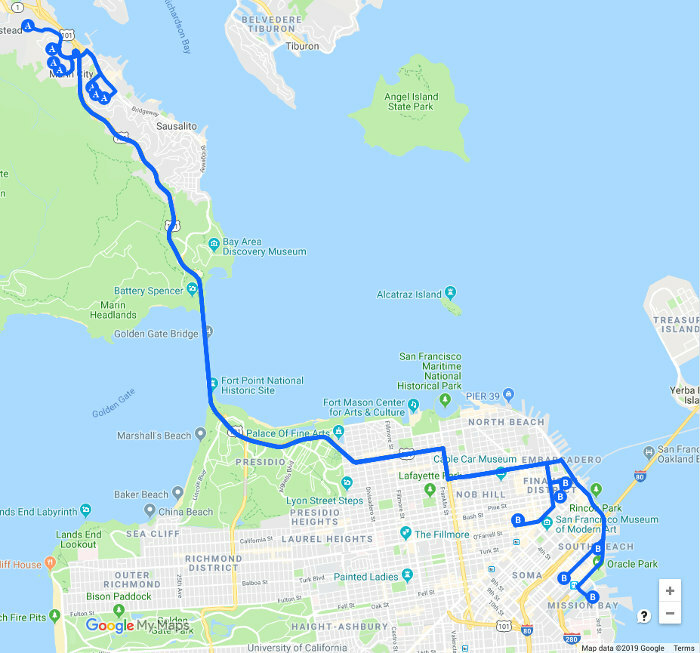 This could be walking, of course, in denser areas, or things like Uber, though they tend to have a $5 minimum cost for that first or last kilometer. A switch in transit from "Move people along lines from stations" to "notice groups of people at A who want to get to B, and get them there" in combination with the regular door-to-door robotic and human driven taxi services will have an effect on our cities. Some of the effects are sure to be controversial. The idea of the "transportation hub" vanishes along with the push for higher density around it. Instead, higher density works only because the residents like the walkability and cost savings more than they dislike the negatives of density. You may wish to reference my earlier articles on Robocar effects on urban planning and Robocar Oriented Development. In some cities, the vans don't go on the highway. Instead, the head to the old railway tracks. These tracks have been modified with cheap paving and two reinforced concrete strips on either side of the rails. The robocars drive so accurately they only drive on those strips. In short areas the pavement rises up level with the rails to allow vehicles to get on and off the rail. In some cities, the passenger trains are mostly gone and so these rails provide a fast private ROW for the vans. In other areas, the trains are still running but share the path with the vans and cars. On commuter rail lines, where train headways are 10 to 15 minutes, this is not a big problem, but the main issue in all cases is that trains stop at stations. The vans could stop behind them but don't want to. Where possible, stations have been widened to include one or two express bypass strips or elevated tracks over or under the platforms for the vans. Some train stations already have an express bypass, but adding one is easier for cars that can turn and climb faster than trains. For lower volume trains, the cars and vans just divert to the other track because they know where all the cars and trains in the other direction are. Cars in the other direction are much fewer, and they time their trips to avoid contention. Of course, sometimes two trains meet at a station and everybody has to stop for a minute, but they pass soon enough thereafter. This has become a huge win because train tracks are way underutilized. A typical track segment has a train using it just a tiny fraction of the time, because trains are often tens of minutes apart, and rarely less than 3 minutes apart. That's a lot of spare track time, and has lead to the relatively inexpensive conversion of many rail lines to handle both trains and self-driving vans, buses and cars. There are some potential big advantages to the use of medium sized vehicles when it comes to road repair and maintenance. Road damage goes up roughly by the fourth power of the load per axle. An urban bus causes 850 times as much road damage as an ordinary car. 18 wheel trucks cause thousands of times as much. The hypothetical van here would probably cause about 10 times the damage of a car, but less than the dozen cars it replaced. The elimination of heavy buses would result in a serious reduction in road wear and maintenance, as well as the embedded energy of this work. Most of what I've described above is very rider focussed. The goal so far is to provide the most convenient and pleasant ride for the rider, because only that will succeed in a competitive market. It also happens to outdo existing transit when it comes to public good in terms of energy used and road congestion. Today's human-driven, schedule based mass transit is surpisingly inefficient. Let's examine where it wins and loses. Almost every transit system is mostly large vehicles -- buses that hold 40 to 120 people, and trains that hold even more. Yet the operating costs of transit lines can be over 70% labour. The dominance of labour is the primary factor pushing lines to use large vehicles, running less often. To run half sized vehicles twice as often will cost a great deal more in labour, though riders would love it. This is not an issue when the vehicles drive themselves. Large vehicles shine only at the peak commute hours. There, they are very efficient, the larger the vehicle the better. On top of that, commuters even tolerate standing in packed vehicles at rush hour which increases their efficiency, though obviously no rider actually likes that, and in fact it's one of the factors that pushes people into private cars. The commuters don't have much choice. The problem comes when all you have is the large vehicles. These same large vehicles run at off-peak times, and towards the end of long commute lines much closer to empty. The consume as much road space and almost as much energy. The low load in large vehicles off-peak is so poor that the average transit bus system in the USA uses more energy per passenger than the average private car. The light rail systems are even worse. The subway systems are better, but not as much better as you might imagine -- they still don't beat efficient cars. The commuter rail systems which only run at rush hour are the most efficient, but again can't beat small electric cars with just one person in them. I've made a rough chart of different types of vehicles with their capacities (both seated and full, including people standing) and the resulting passenger miles/gallon (PMPG) for them. The "RoboVAN" I describe here is the specialized van described above, around 7'8" wide and 16' long, not much larger than a large car in a 4 rows of 4 configuration. In a 5 rows of 3 configuration it would be longer but have less drag. It's a hypothetical vehicle -- it may need to be longer for safety -- but since they can make 12 passenger vans today at 15mpg, I feel it is safe to say this could be made at 20mpg or even much better if electric. Articulated Bus ~3 60 120 ? 360 180 30-50? Unscheduled, robotic transit can run mostly with "right size" vehicles. Larger vehicles where demand is high, smaller vehicles where it is low, and very small vehicles when there are few people with a route in common. Combinations can also be used: While a 40 person bus is more efficient, two 20 person buses only use a bit more energy -- with much greater convenience for the riders, but 20 person buses can also do service efficiently on lower demand routes. Large vehicles can be purchased for rush hour, but that's very capital-intensive, since you don't want to use them off-peak if you have smaller vehicles at hand. A mixed fleet -- with some large vehicles, some medium, some small, and lots of taxis meant for 1-4 passengers can tune the equipment to the demand in a dynamic fashion, Rarely using a vehicle that is mostly empty seats. The exact optimum size and count of vehicles will depend on the loads and budgets. In some cases, the older vehicles may get retrofit simply because they are there. Going on-demand is also key. Scheduled transit is planned and run regardless of variations in load, and as such you send a vehicle for maximum load regardless of actual load. In fact, transit schedule intervals are often based on that load -- passengers might love a bus to come every 10 minutes, but to fill each bus, you have to run less often. Robotic transit can adjust capacity in real time. If a 20 person bus fills up, you can just dispatch another bus or even car to handle the excess. I have a blog post on factors affecting the optimum vehicle size with more details. The main downside of travel on the roads is traffic, and traffic lights. When it's really bad, transit is often given private right-of-way, like subway tunnels, to make it compeitive. Comments can be left on the blog post.